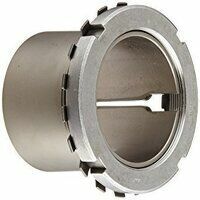 View our selection of bearing adaptor & withdrawal sleeves here. Suitable for use on K type, tapered ball & roller bearings. Adaptor sleeves are most often used for locating bearings with a tapered bore onto a cylindrical seating. They can be used in several industries including but not limited to agriculture, mining and general engineering. Buy online today for great prices and fast delivery.